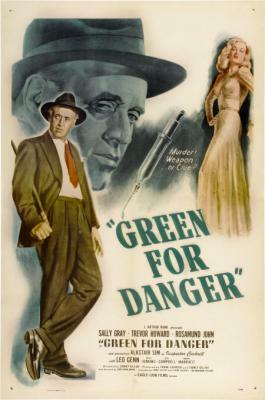 Sidney Gilliat’s Green for Danger, based on the novel by Christianna Brand, is a terrific whodunnit, replete with the cream of the crop of post-war British film thespians. The story takes place over the course of one week in 1944 at Heron’s Park Emergency Hospital, a requisitioned and converted Elizabethan manor in the English countryside. The atmosphere is claustrophobic, as the doctors, nurses, and administrators tend to the sick and the wartime wounded while squabbling and engaging in petty jealousies as German bombers fly overhead. Alastair Sim, who plays Inspector Cockrill, doesn’t show up until halfway through the film, but he narrates it from the beginning, introducing us to a group of doctors and nurses circled around a patient in the operating theater; surgeon Mr. Eden (Leo Genn), a stocky, dark-haired Lothario; anesthetist Dr. Barnes (Trevor Howard), who is engaged to the pretty blonde, Nurse Linley (Sally Gray); hysterical Nurse Sanson (Rosamund John); strait-laced Sister Bates (Judy Campbell); and portly Nurse Woods (Megs Jenkins). Inspector Cockrill informs us that it is August 17, 1944, and that by August 22, 1944, two of these characters will be dead, and one of them will be revealed as a murderer. I like a mystery that establishes its parameters early in the story, and Green for Danger does exactly that. The fact that we’re quickly introduced to the six main characters while their hair and faces are covered by surgical caps and masks means you’ll have to be paying especially close attention if you want to remember who everyone is at first glance, but if you aren’t, never fear. The characters in this film are sharply drawn, and the actors bring them to life wonderfully. Trevor Howard as Dr. Barnes is the embodiment of the British middle class; his entire body is one big stiff upper lip. Leo Genn probably isn’t anyone’s current idea of a ladykiller, but his smoothness and charisma make him utterly convincing. Sally Gray is lovely to look at, although when she and Rosamund John were both wearing surgical caps I found them difficult to tell apart. I especially liked Judy Campbell, whose role could have been one-note, but who manages to instill the severe Sister Bates with a good deal of humanity. The first murder — or was it murder? — takes place when a postman named Higgins (Moore Marriott), injured after a bomb attack, dies on the operating table. Recriminations fly, but his death is written off as an accident until one of the nurses screams during a party that she knows it was murder, and she can prove it. She rushes off into the night, stalked by a killer. This sequence is genuinely terrifying, and is reminiscent of an Italian giallo, with dark shadows, swinging doors, and shutters blowing open and closed in the wind to create dramatic lighting effects. Inspector Cockrill’s appearance marks a shift in tone, as the film becomes more comic. Cockrill is the diametrical opposite of Dr. Barnes and Mr. Eden. While they are perfectly groomed, neatly coiffed, and sharply attired, he is bald, with shocks of gray hair above his ears, outfitted in an ill-fitting, rumpled suit with a drooping pocket square. He’s a collection of tics, constantly shrugging his shoulders and raising his eyebrows. Alastair Sim is a fantastic actor, and he exudes authority as Inspector Cockrill, even when he’s doing a pratfall. Cockrill is a fantastic creation, and watching this film made me wish there were an entire series of films featuring the character. He keeps his suspects constantly off-kilter with inappropriate jokes and ironic comments, and he seems mildly amused by everything, including himself. Green for Danger was one of the most pleasant surprises I’ve had lately. It’s genuinely good escapist entertainment. Posted in 1946, December 1946 and tagged Alastair Sim, British Cinema, Christianna Brand, Claude Guerney, Eagle-Lion Films, Frank Launder, Frank Ling, General Film Distributors, George Woodbridge, Green for Danger, Henry Edwards, Herbert Smith, Individual Pictures, John Rae, Judy Campbell, Leo Genn, Megs Jenkins, Moore Marriott, Mystery, Ronald Adam, Rosamund John, Sally Gray, Sidney Gilliat, Thelma Connell, Trevor Howard, Wendy Thompson, Wilkie Cooper, William Alwyn, World War II. Bookmark the permalink.